It would seem that many of my age remember the 1947 winter as their first recollection. I was born in 1944, in Faversham, but moved to a cottage at the top of River Hill overlooking Knole Park. That winter, my father saw a rabbit try to escape into a snow drift opposite the house but, knowing that there was a wall beyond, he burrowed after it, caught it, skinned it and we had it for dinner the next day. We moved to a flat in Riding Lane in 1948 after my father got a job with Mr Hendry who ran the Post Office next to the Church. My father, Paul, became manager and postmaster and worked in the shop until he retired. My father Paul had in fact been born in Hildenborough in 1920 and had lived at the far end of Church Road. He went to Hildenborough primary schools from the age of 6. He had the most amazing memory of his time at school and I recall when the school produced a booklet to celebrate 150 years, he was able to identify most people in the school photograph taken at that time. When he left school he worked for the Co-op butchers in Sevenoaks before he was called up for the war in the Royal Marines. He had training in Scotland and was then embarked on a troop ship destined for Burma. Fortunately the war with Japan finished shortly after they landed in India. After moving back to Hildenborough my father and mother were very active in the village activities. My father with the Boys Brigade and a keen member of the cricket team, and my mother with the Girl Guides and Sunday school. 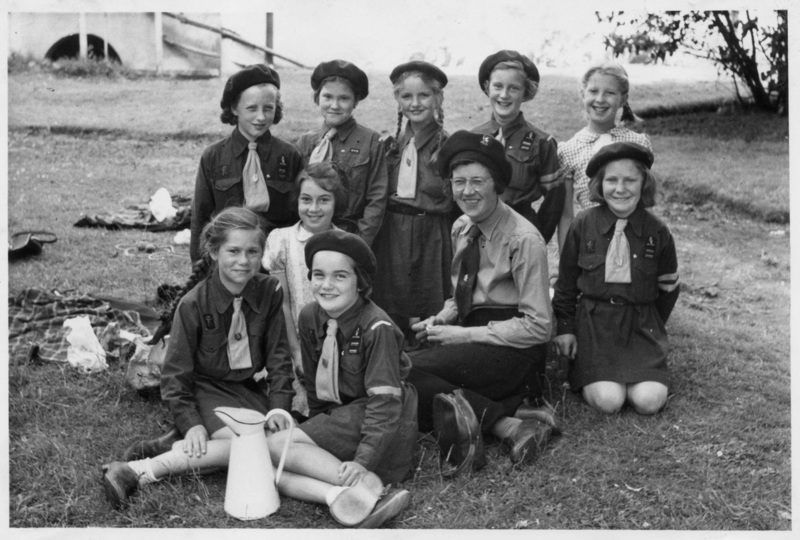 I was a very keen member of the Brownies and Girl Guides and finished as Company leader. Back Row, l-r: Carol Eldridge, April Jenkins, Janet Haisell, Sheila Goldsmith, Susan Utley. Middle Row, l-r: Christine Fuller, Brown Owl, Christine Kennard. Front Row, l-r: Sonia Dyke, Jennifer Peal. I went to Hildenborough primary schools in 1949 shortly after my brother Richard was born. My time at Hildenborough followed the exact path of Carol Miller, née Owen, whose story is in the web site. Carol and I were next door neighbours until my family moved to Tonbridge in 1960 but were close friends throughout. I can also remember the coronation but have a slight disagreement with Carol. We went to watch it on television with the Spooner's which I thought was the only one in the road. I also have fond memories of Mr Haisell taking over from Mr Fitz and also of Mr Emery who was brought in at the same time as the teacher in my final two years. I have a few photographs from that time of the Fancy dress parade and the May queen, but they are not at all clear. Naturally I can identify myself and a number of my friends and also my future husband, Roger. The best picture of all is that of the Christmas pantomime during my last year. I have been able to name nearly everyone including Carol Owen playing her recorder next to me. Back Row l-r: Keith Osborne, Alan Clarke, Stephen Denman, Robin Jupp, Stuart Branch, Susan Utley, Gillian Mayger, Anna Vaughan, ?? ?, Julie Baker, Joan Pratt, Sheila Goldsmith. Middle Row l-r: Colin Bastable, Keith Elves, Marshall Browning, Tony Sawyer, Mary Goddard, Barbara Manser, Alan Piper (hat), Peter Killick, Sandra Shave, Janet Haisell, Andrea Mitchell, Catherine Hayward, John Crisp, Michael Lorenzo, Christopher Franklin, David Manners, Ronald Coleman. Front Row l-r: Christine Fuller, Alison Lutley, Martin Hayward, Madeline Kennard, Hilary McCredy, Carol Eldridge, Carol Owen, Irene Waghorn, Jennifer Peal, ??? I remember our first holiday after my brother Richard was born in 1947 which was at an hotel in Eastbourne for a week which seemed to be the height of luxury. Mummy really enjoyed being spoilt. We stayed in my uncle’s bungalow at Winchelsea two or three times. Daddy would lay fishing lines as the tide came in but had to get up early the following morning to take the fish off the ebbing tide. They were cooked and eaten that day. These holidays by the sea gave my brother and I the freedom that children do not have today. They may have been modest by today’s standards but we enjoyed them all and were luckier than some whose summer holidays may have been day trips to the Tunbridge Wells Cricket festival or just hop picking. Princess Christian Farm colony was situated about 2 miles down Riding Lane and linked to Princess Alexandra House in Vines Lane for the ladies. Nearly every Saturday the “boys” would walk up Riding Lane, hand in hand, and then all the way to Tonbridge to watch the football, about ten miles in all. They always seemed incredibly well behaved and I do not believe that there was any problem during those walks or indeed at any other time. When I left Hildenborough, I went to Hectorage Road for two years and then to the Tech for a very happy period of four years. During that time I decided that I would like to become a physiotherapist but had to work hard to get the required O levels. Luckily for me, the Tech moved to the top of Pembury Road and at the same time employed some new teachers, two of whom helped me enormously with Maths and Physics. In my last year or two at the Tech, I started going out with Roger Hayward who became my husband in 1966. We had known each other since our time at primary school during which we often met on a Saturday because both our fathers played cricket for Hildenborough. It would be fair to say that he was not much interested in me at that time primarily because “girls” were a no-go area at his age. Luckily, he overcame that problem! I managed to get the necessary O levels and enrolled at The Royal London Hospital in Whitechapel in 1964 and qualified in 1967. It was during this time that I became engaged and in fact married whilst I was still training. That in itself was an incredible achievement because I was the first. The head of department was totally against it, but a rather younger and more liberal matron gave her permission. Some years later, Roger met a younger Physio who had trained at The London. Even though there had been a 15 year gap, when Roger told her the story she exclaimed “ Oh, she was the one!” Such is fame. Our wedding at Hildenborough Church was very much more low key than today, but none the less memorable for that. My wedding dress was made by my mother who was an accomplished dress maker and the buffet reception was prepared by my mother at the church hall. Roger had to fork out for the choir and the vicar and the bells and, of course, for the honeymoon. In order to “escape” from Roger’s relatives after the wedding, he had to come up with an elaborate subterfuge to convince everyone that our car was parked in Sevenoaks. The relatives left us in peace at Hildenborough station and set off at speed to get to Sevenoaks to meet our train. Unfortunately for them, we did not get off because we went straight on to London where Roger had left his car behind my hospital in Whitechapel the night before loaded up with our cases. Our honeymoon was in Wales, staying in Trust House Forte nearly every night. We find it almost unbelievable that the total cost was about £20. Roger still has his Post Office book showing that he took out £10 on the morning of the wedding, plus whatever he had in his pocket. We had a lovely honeymoon in Wales but had always planned to have a full week and not return on the following Thursday for the start of my final term. Roger phoned in from Wales and excused my absence with a bad cold. I was told later that when this was announced to the head of department in front of my class colleagues they found it difficult to keep straight faces. They could guess the truth. We lived in East Ham for two years before moving to Billericay in Essex where we still live. I had our daughter, Jacqueline in 1968 and then our son Andrew in 1971. In between we were sent to Jamaica by Roger's firm and spent an exciting time there. We came home via Mexico City, then Detroit to visit Roger's aunt & uncle, hire car to New York and the La France liner back to Southampton.